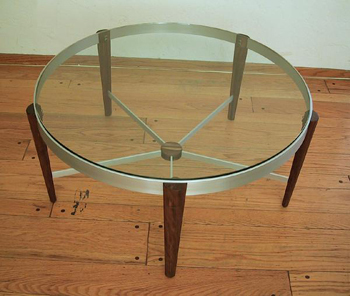 Sean had purchased the pair of Three Leg Side Tables recently and wanted a coffee table to complement their design. The leg shape and center stretcher connection followed suit from the side table. Sean decided on five legs in keeping with the "odd number of legs" theme. The diameter of the top was dictated partly by the narrow width of his flat in London. I say partly, because he will almost certainly move, and wanted the size to be right for any of his future dwellings.